The Department Of Transportation, New York City, found great inspiration in the streets of Copenhagen on how to get New York City more bike friendly. 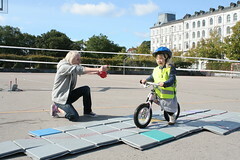 On December 1 2011 the Bikeability project hosted it’s midterm seminar. 85 persones attended – out of which some 60 came from various state- and municipal institutions, NGO’s and private firms.